The March 2007 meeting was never called to order by President Jim Cook. We only had a handful of people; so, we just worked on projects. 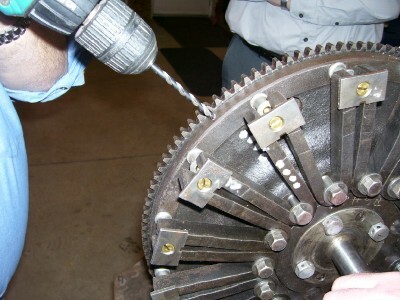 There was a hands-on demonstration on balancing drive train components. We discussed getting a balanced set of rods and how different rods were inherently off center. Lastly, we looked at some clutch assemblies to see the different places that they tend to crack and how well they can be balanced. The low level of attendance at the meeting was a concern. Although the weather wasn't that bad, it may have kept some away. We try to present interesting topics and pertinent projects. The interest just seems to be lacking. I would ask that everyone give us some feedback on what they would like to see at the meetings to make them more enjoyable. We want to have fun and learn at the same time. The April meeting will have a demonstration based on the following E-mail that I received from Jack. I am currently in rehearsals for a production of "Don't Hub Me" at the Ritz Theatre; but, I've begged off for Wednesday night to be with the group and help out. Jim: I have received a timing device for testing and evaluation from TW Components in Indianapolis. Tony Wilshire has devised this tool for setting the timin of the Model T. It is advertised on page 43, Vintage ford Jan-Feb 2007, vol 42 #1. I think its use would be a good program for the April meeting and YOU should demonstate it. I'm biased because I have been instructed on how to use it. Someone who has to read his instructions should do the demo. Your thoughts? 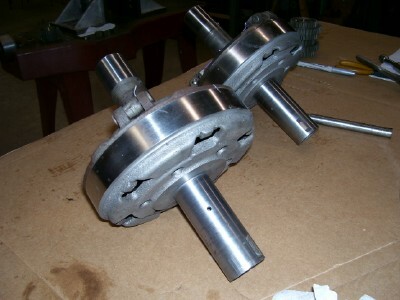 picture above, you can see that bearings have been used to provide the cradle for the spinning mass to set in. We were able to watch the flywheel rotate and note where it stopped. 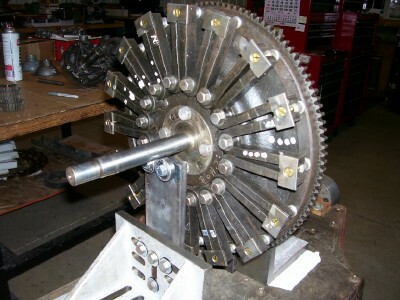 The white dots denote the heavy spot of the flywheel. This is where we drilled a hole to lighten up that side of the flywheel. The picture does not show the shop vacuum that we used to pick up the chips as the drill was applied to the edge. Otherwise the magnets would have been hairy with metal shavings. 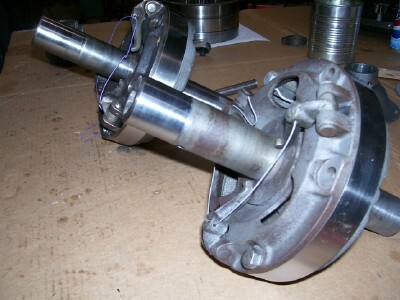 The brake-clutch pack brings on a different set of problems for balancing the drive train of the Model T. There isn't anywhere on this thing to drop any weight. Any drilling on this subassembly would drastically reduce the strength of the casting. In this case adding weight to the lightest side of the casing would be the answer. A little bit of braze to the head of the bolts would be the best place to add weight in the desired area. Please let us know if you have come up with a better solution to this problem. The one thing that we wouldn't want to do is change the heat distribution during braking. As I've already mentioned, we need everyone's input on pojects or demonstrations to do at upcoming meetings. We want to benefit as many of the members as possilbe. Many of the members are happy to just sit back and see what happens. Unfortunately we can not survive as a club with too many members in that mode. Its funny that our membership is at an all time high and the club meeting attendance is at an all time low. On a personal note, I have had both of my T's out on the road this Spring. The 1926 was used for a 1920's murder mystery at the Tiffin Public Library. The interactive mystery was set in a Chicago speakeasy during prohibition. The owner had just been murdered and of course all of the suspects had motives. It was up to the crowd of 130 patrons to solve the mystery. Old Henry (my great grandfather's 1916) has been out every month of the Winter and is currently sitting up on jack stands at my mother's house. All of the wheels have been removed and disassembled. I made arrangements with an Amish gentleman to make a new set of round felloe wheels for David Cockey from Michigan and myself. The rims and hubs were delivered on Saturday the 31st of March, with expected pickup on the first week of May. Only one of the wheels on Old Henry was the correct wheel for a 1915-1916 car; so, it is being used as a pattern for all of the other wheels. I'll let everyone know how things work out. This man comes highly recommended for old car wheels. The Brass and Gas guys have used him and I've seen a set of early Model T wheels that were just beautiful. These trips also give me a chance to check out some roads that I'm planning on using for an upcoming tour. The 19th Annual Ohio Model T Jamboree will be held August 31 - September 3, 2007. The tour will run out of Mount Vernon, Ohio. Mount Vernon is just south of Mansfield.